After two games in 22 days against teams running a triple-option offense, Irish head coach Brian Kelly said he’s relieved to get through without any injuries from the scheme’s use of cut blocks. Senior running back C.J. 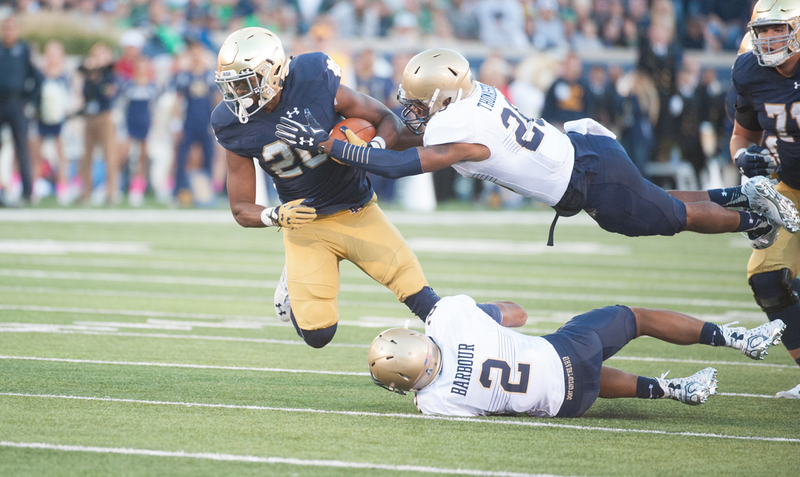 Prosise attempts to evade two defenders during Notre Dame’s 41- 24 victory over Navy on Saturday. There were a pair of injuries suffered Saturday by Irish players — freshman defensive lineman Jerry Tillery and graduate student center Nick Martin both exited at various points — however, Kelly said he doesn’t expect either to have an impact. On the return front, Kelly said sophomore and starting left guard Quenton Nelson could be back in time for Saturday’s contest with USC. With two games on the schedule this year against triple-option teams, and a pair again next year (Army and Navy), Kelly and special assistant to the head coach Bob Elliott set out to put together a scout team — later termed the S.W.A.G. team — headed by a triple-option quarterback, freshman Robert Regan. “Coach Elliott and I had discussions about beginning to put together a scout team for the spring, and as we had talked about it, we had — we were also going through a recruiting meeting and putting together some names,” Kelly said. “We were recruiting a kid out of this high school, Hinsdale Central, and one of his buddies was the quarterback. He was a triple-option quarterback, and he applied to Notre Dame. That quarterback was Regan, and following Notre Dame’s 41-24 win over Navy on Saturday, Kelly awarded Regan the game ball. “The guys love him. He sang the fight song. That’s the first time we had a true freshman stand up, and he got the game ball and sang the fight song, and there was a huge roar from the team,” Kelly said. After the announcement Sunday night that Trojans head coach Steve Sarkisian was taking a leave of absence from the team and then his subsequently firing Monday afternoon, Notre Dame will be facing its fourth USC head coach in the last four years Saturday. Folllowing its 17-12 loss against Washington on Thursday night, USC dropped out of the polls — after starting the year ranked No. 6 — and Kelly admitted the Trojans’ slide changes the way the Irish look at the game but noted Saturday’s visitors still have a talented squad. Despite the Trojans being outside the elite ranks of college football for a while now, Kelly said the rivalry still holds significance. “There’s a special feeling playing USC, and I know that that still resonates with our players and coaches,” he said. Last year, the Irish were walloped in Los Angeles, 49-14, to close the season, and Kelly said the Irish want to put on a better show this week. When Kelly and the Irish staff made a halftime switch to bring linebacker Jarrett Grace into the game for junior James Onwualu, it gave the graduate student, who recently overcame a long injury layoff, an opportunity to shine — the Irish held Navy to just 79 yards on the ground in the second half after the Midshipmen put up 239 in the first half. “It was as meaningful for him [to have success Saturday] as it was for me, just to know what he’s gone through and to be called upon to come in and play a very important role for us,” Kelly said.